Towers of exotic colour in even the smallest of gardens. Be the envy of your neighbours with a torrent of bright, star-shaped blooms, continuously for 6 months – every year! Blooming Brilliant! Compact ‘flower-towers’ lasting 6 months each year. Easy to manage and growing to just 4ft tall. Supplied as mature plants on a 60cm cane trellis for support. 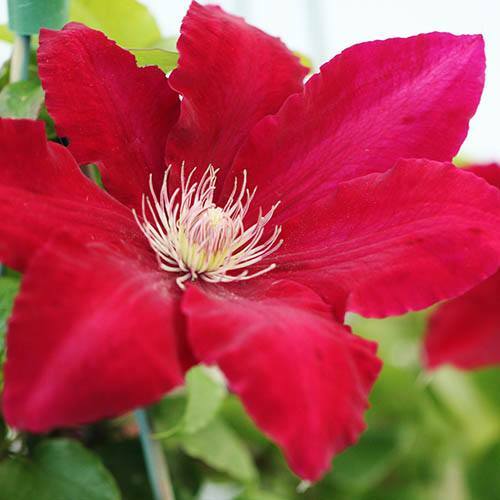 The BOULEVARD(R) Series of clematis has been bred specifically for a compact growing habit and a precocious flowering nature - so you can create a massive colour impact from a very limited space. Perfect for growing in small spaces, in pots and containers, so are ideal for modern gardens where space may be limited. BOULEVARD(R) clematis are robust, hardy and easy to grow with vigorous re-growth every spring. Pruning is simple - just cut back by a third each year as growth begins again. Bred and developed by world-renowned specialist Raymond Evison, Rebecca(TM) Evipo016(N) was launched at the 2008 Chelsea Flower Show and will captivate all summer long with its glorious, large red-burgundy blooms and repeat-flowering habit. Plants only require a minimum of annual maintenance - cut all stems back to 15cm (6') in Feb/March– PLUS they are totally winter hardy too! Supplied as an established plant in a 2L pot on a support trellis, ready to be planted out or potted up.